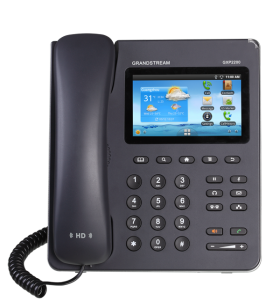 GXP2200 represents the future of enterprise business telephones in modern Internet age. Featuring Android™ Operating System 2.3 and its vast number of 3rd party applications, a 480x272 capacitive touch screen TFT LCD, dual Gigabit network ports, integrated PoE and Bluetooth. The GXP2200 delivers superior HD audio quality, leading edge telephony features, integration of rich Web content with access to the rapidly growing Android™ applications base, automated provisioning. Built with advanced security protection for privacy, this enterprise application phone also features broad interoperability with most 3rd party SIP based devices, IP PBX and major IMS platforms. The GXP2200 is an innovative smart desk phone loaded with tremendous value for Web-integrated business communications as well as unprecedented power for advanced custom business applications development and personalization.